By Peter Rowan (University of California, Berkeley, or Cal for short). Find a Special Announcement at the bottom! I’m a Bear. A Berkeley Bear. Or so I have been told. So let’s talk about what it means to be a Berkeley Bear. It was blisteringly hot as we sat above the huge amphitheatre. Over the rippling air the band struck up with the Star Wars Imperial March and UC Berkeley chorused with screams as the Chancellor walked to the stage, and welcomed us to Bear Territory. I remember little of the substance of what he said now, but the message of the event was clear: pursue excellence in all things, live life to the full and enjoy. And I’d like to think that so far I have. In just about a month I have deconstructed Western Political thought, embarked on a personal quest for perfect balance, learnt the history of Mexico, committed to international service, and dived into the fantastic world that is California. 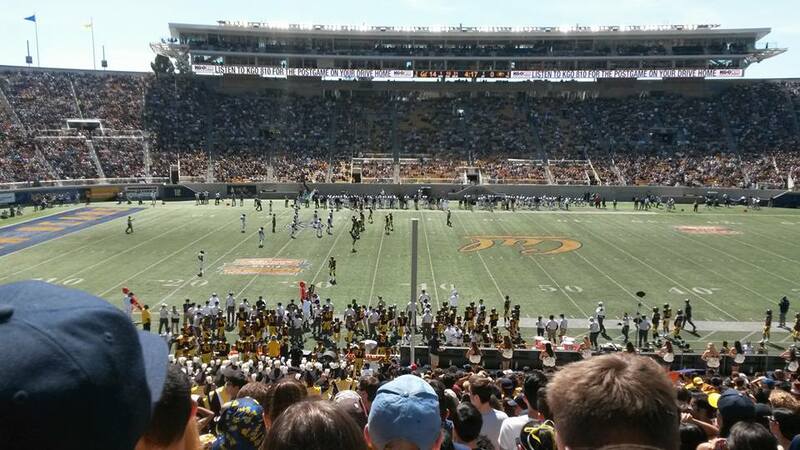 My head is spinning and my eyes are heavy, but the story so far is well worth recounting; to give a picture of what a first month at Berkeley is like, just in case you ever decide to enter the Bear Territory. …A Berkeley Bear lives with passion. They are passionate about their subject. I have been treated to many an inspiring conversation about the nature of black holes, economic equilibriums the nature of the human body and much more. They are passionate about people. People here are so friendly and open and will, at a first encounter, genuinely want to get to now you. They are ablaze with smiles as you talk about interests and travels. They are passionate about Berkeley, never more so than at the great Football Game Day. Three hours before the Fraternity street or ‘Frat Row’ exploded into life with parties: people wearing blue and yellow everywhere. Only after sliding down inflatable slides and impressing people with our accents did we head on up to the stadium, where the entire crowd stood atop benches. Yes, cheerleaders are real, they do backflips and everything! And yes, there was a band in feather hats marching up and down the field. But that moment when we scored the first touchdown… I have never heard anything like it, it was a huge roar of 20,000 Bears shouting us on to victory. We’ve won our three games this season so far – strong start. Political Economy: A complete deconstruction of Western Political thought, with the major works of Machiavelli, Hobbes, Locke, Rousseau and Smith read already! The Southern Border: A study in the US’s relations with Central America, thus far with a complete history of Mexico. California: A complete overview of the state, so far having looked at its Native American and Settler history, industrial period and drought crisis. Post-Colonial Geography: With Gillian Hart (a Geography heavyweight) – this one really messes with your head. It starting from Huntington’s Clash of Civilisations, a paper that proved influential to the Iraq war, it portrayed the world as pertaining to clear territorially bounded cultures that inevitably will clash. We have critiqued this simplistic view to the point where we are looking at Massey’s concepts of space and Coronil’s Occidentalism, and I am left to ponder what it even means to be a human. What do you think when you see that word? Toga parties? Lots of drunk American ‘dudes’ calling each other ‘Bro’? To an extent you would be right… and Peter just joined two! But do not be deceived, amongst the ashes there are a few gems, and the ones I have found are really quite special. Fraternity number one: Sigma Phi Epsilon. This is a ‘social’ fraternity, founded on the philosophy of the pursuit of the Balanced Man. By joining, I have committed to developing a Sound Mind, Sound Body and Sound Spirit through a journey of self-exploration and challenge along with my Brothers. It is a house of 70 of the most talented and motivated people I have ever met. From triathlon champions, to academic geniuses, to surfers, to guys who run a club devoted to doing medical work in a different country every semester. As part of fraternity life, we share our specialisms through classes, pushing each other forwards to achieve total excellence. Fraternity no. 2: Delta Phi Epsilon. This one is a ‘professional’ fraternity focused on international service. With members who have worked in embassies, governments and NGOs across the world and alumni in top law, IR and business grad schools, this really is an exceptional group of people. I have never had such interesting late night conversations… debating the Greek crisis in a national park at 3am is a very special experience! Exploring the concrete jungle of San Francisco, and sitting on the dock of the bay and eating prawns from a rock heated to 500°C. Swimming in the Pacific Ocean at Santa Cruz, where a few surprise 12ft waves forced us to swim right out… that got the adrenaline going! I must admit, culture shock and fatigue have been difficult demons to fight off. Living abroad isn’t always fun and games, and I certainly hit a deep dip after the initial post-arrival adrenaline wore off. But after a bit of meditation on Bear Peak overlooking the San Francisco Bay, and some deep conversations with my new brothers, I have learnt a lot about myself and developed a much stronger resilience, and now I’m ready to go for the rest of semester one! In the pursuit of a Sound Body and Sound Spirit, on October 3rd my Fraternity Brothers and I will be hiking 18 miles across Yosemite National Park for Charity! After a brother died of a rare disease called histiocytosis, we are raising money to fund research into the disease. Any donations would be very helpful, even just a couple of quid. Thank you for your kindness! @lilybakerhaynes soaking up those last few #uom_goabroad days in Puebla!